More than 30 years after his final fight, Muhammad Ali memorabilia and card prices continue to see strong growth. A legend inside the ring and out, Ali is an icon unlike none other. Emerging on the public scene as a cocky young fighter named Cassius Clay, he won the light heavyweight gold medal at the 1960 Olympics in Greece. From there, he went entered the professional scene, changing boxing forever. Shortly after winning the heavyweight title in 1964 over Sonny Liston, Clay joined the Nation of Islam and changed his named to Muhammad Ali. Over the course of his professional career, Ali won three heavyweight championships and had memorable rivalries with such fighters as Joe Frazier and George Foreman. A great fighter, Ali was also a magnificent showman. Modelling himself after professional wrestler, Gorgeous George, Ali realized early that is was good for business to have a strong personality. Always good for a quote or a rhyme, Ali became one of the most famous people in the world thanks to this gift. But Ali's legacy won't ultimately sit in the ring. In speaking out against the Vietnam War and refusing to be drafted, he was stripped of his title and had his boxing license revoked. He was also vilified by many, becoming even more polarizing than he already was. Ali wasn't able to fight for nearly four years during the prime of his career because of his stance. 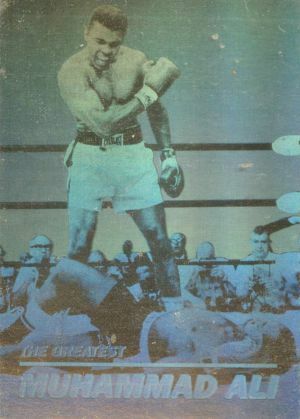 His high status is reflected in the high prices Muhammad Ali memorabilia continues to bring in. Popular pieces of Muhammad Ali memorabilia include signed boxing gloves, photos and boxing robes. Other items collectors might want to consider include issues of Sports Illustrated and other magazines where he appears on the cover and boxing posters. Understandably, Ali's signature has deteriorated over the years. Once a regular signer, he has, not surprisingly, slowed down greatly. With his unique place in both sports and modern history, Muhammad Ali memorabilia should still be considered a strong investment despite its already high prices. He is a beloved figure whose accomplishments make him one of the greatest pop culture icons. The top pieces of Muhammad Ali memorabilia are, not surprisingly, pieces of fight-worn gear. In November, 2011, the trunks Ali wore in "The Fight of the Century" in his match against Joe Frazier sold for $173,102. Considering the stature of Ali and his place in history, there are very few cards of the boxing legend. Most come from the 2011 Leaf Muhammad Ali , 2011 Leaf Muhammad Ali Metal and 2012 Leaf Muhammad Ali: The Greatest releases. Although the compositions are a little different, both are premium sets that chronicle Ali's accomplishments inside and outside the ring. 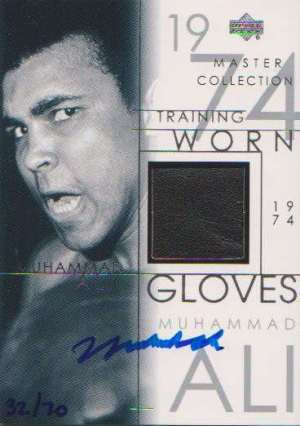 Both also bolster plenty of Muhammad Ali memorabilia, autograph and cut signature cards. Although a more comprehensive boxing release, 2010 Ringside Boxing Round One is another recent and somewhat readily available set with both Ali autographs and relics. He was also in 2011 Ringside Boxing Round 2 as a case topper. All of these sets pail in comparison to the ultra high-end 2000 Upper Deck Muhammad Ali Master Collection. The box set starts with a 30-card base set. Printed on premium stock, each card came with a matching serial number out of 250. Housed in a wooden box, sets also came with an on-card autograph and three Muhammad Ali memorabilia cards (train-worn glove, fight-worn trunks, fight-worn robe) numbered to 50. Finally, collectors received a mystery pack that contained either a one-of-one base set parallel or an autographed memorabilia card. 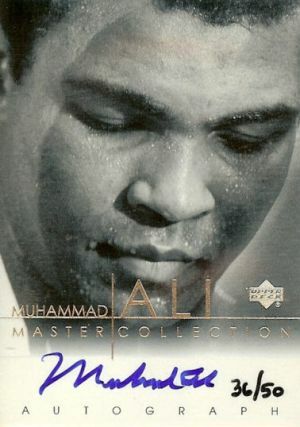 Given the high initial cost and extremely limited availability, most of the 2000 Upper Deck Muhammad Ali Master Collection sets went directly into personal collections. They don't pop up very often and when they do, collectors could expect to pay more than $5,000. Individual autographs from the set top $1,000 while even the memorabilia cards sell for more than $250 each. For those on a tighter budget, 1992 Classic World Class Athletes and 1992 Pro Line Portraits Football have Muhammad Ali autograph cards that usually sell for between $400 and $500. It is worth noting that the Pro Line Portraits card is signed on the back. Authentic versions of the card can be identified by the embossed stamp on the bottom corner of the card. 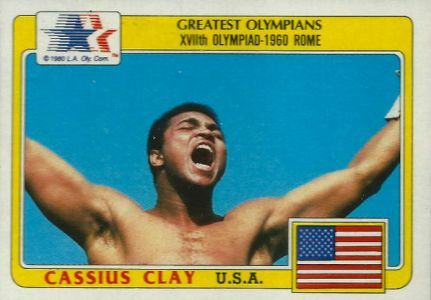 Perhaps the most popular and widely available Muhammad Ali card comes from 1983 Topps Greatest Olympians. Pictured as Cassius Clay, as he was named when he won a gold medal, the horizontal card depicts a young version of the boxer celebrating with his mouth open and his arms raised. Raw copies of the card can be found for less than $10. Because the card has widespread centering issues, collectors may want to track down professionally graded copies for a little added piece of mind. The 99-card set features many legendary athletes and is one of the most over-looked sets of the 1980s. 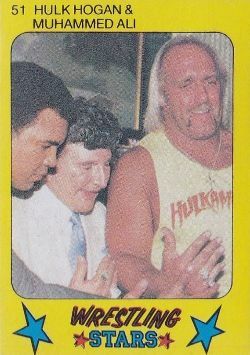 Additional Muhammad Ali card highlights include several basic cards in 1991 All World Boxing, a hologram insert in 1991 Kayo, a spot in 1992 Kayo Holograms and a 1986 Monty's Gum Wrestling Stars card in which he's pictured with Hulk Hogan. 2017-18 LEAF PEARL HOCKEY DUAL MUHAMMAD ALI MICKEY MANTLE 2 2 SP! 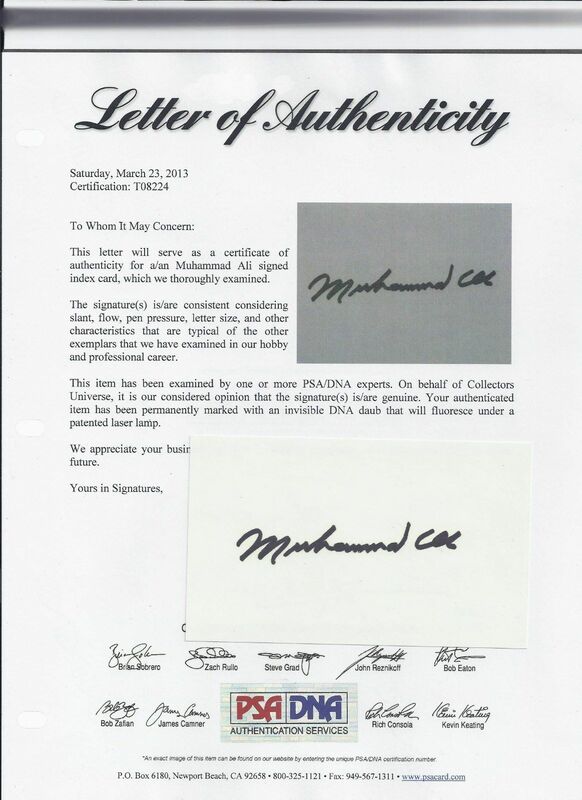 Below you will find an example of what Muhammad Ali's authentic signature looks like. This can be used as a first point of reference for determining the legitimacy of autograph memorabilia, but is not a substitute for having your items authenticated by a well-respected professional autograph authentication company. Some of the trusted sources within the sports memorabilia market include the following companies: PSA, JSA, and Mounted Memories. Muhammad Ali Key Signature Attributes: Due to Ali's longtime and ongoing battle with Parkinson's Disease, his signature has changed frequently through the years. As a result, his signature can be very hard to analyze let alone authenticate. Additionally, his name change back in the 1960's creates the added challenge of authenticating signatures for multiple names of the same person. 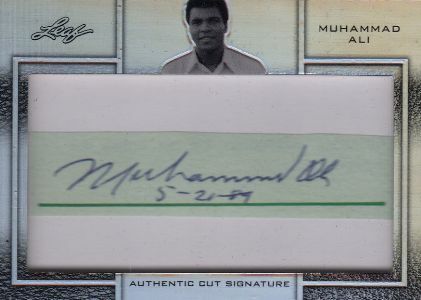 Because of his tremendous popularity, Muhammad Ali signatures are one of the most forged in the sports memorabilia industry. 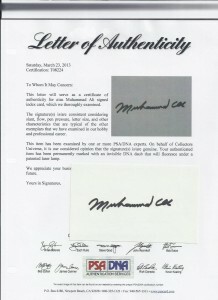 We have provided signature examples, above, that PSA (Professional Sports Authenticator) has authenticated over the years. 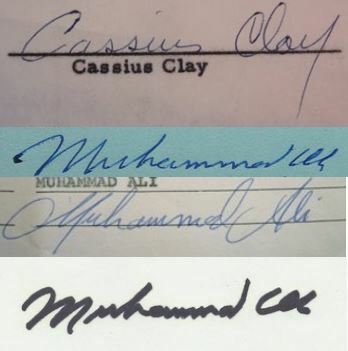 A hand-writing analysis of each signature would not do justice to collectors, as his signature varies so significantly depending on the era signed and even his specific health on any given day. The following signature traits are general and not absolute. The signature exhibits an overall consistency that lows, with very few starts and stops. The entire signature is written on an even horizontal plane. The letter "M" is always legible, and each letter is attempted. Muhammad Ali - Joe Frazier Signed 16 x 20 Color Photo, JSA Full Letter Coa! 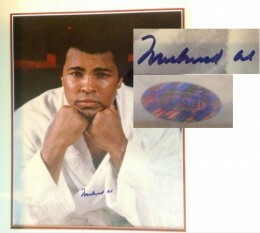 MUHAMMAD ALI signed 8x10 photo - JSA Certified (Full LOA) Autograph !! I love my cut auto of his..It’s almost like the one above..A pc keeper. I have all SI Mags w/Cassius Clay/MA on the covers. Do you have any idea what I can do with them? I have an Islamic pamphlet signed by Muhammad Ali that I would like to sell. Any idea what I should do with it? James Manwaring � It would be a good idea to get it authenticated by PSA or JSA first. I have a miniature glove signed by Muhammad Ali and the other glove signed by Ken Norton as well as an original media guide from the there first fight. I am curious if I have something valuable/rare or just something run of the mill. 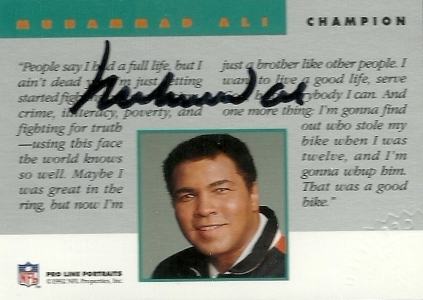 Brad Connell � Anything signed by Ali is special. If it’s something you’re considering selling one day, getting the signatures authenticated by PSA/DNA or JSA would be recommended. I have been offered the chance to buy a signed Ali robe for �3000 but I am unsure as to how rare these robes really are? I came across some cards. Cant seem to find any information on line. Hollywood Stars Dual Glove Worn Memorabilia. I like to send pictures and see what these are all about. 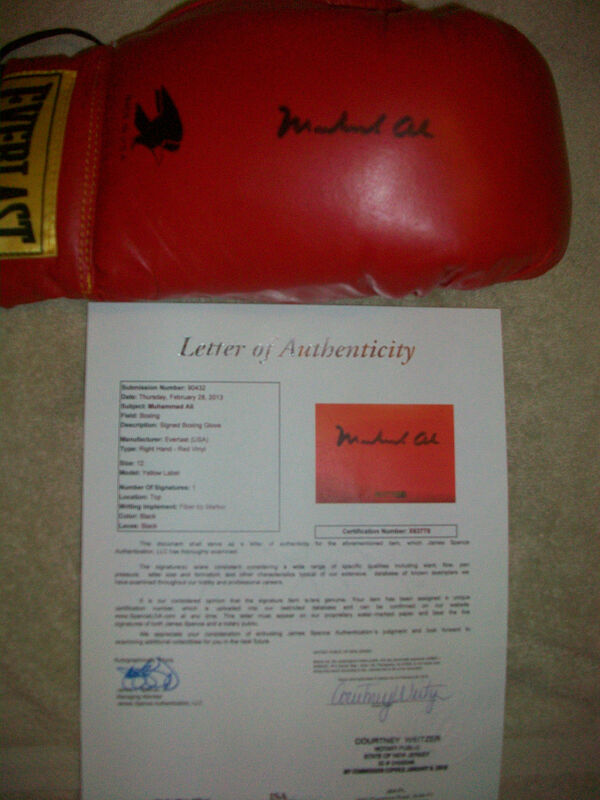 I recently bought a boxing glove signed by M Tyson. l. levis, G foreman and m. ali. at a charity auction who received their items from an organization called charity fundraising packages with a COA from Michael N. Ciravolo. at R&M real. Now I have time to research it says most collectors stay away from multi signed items. I found one website saying charity fundraising packages is known for giving out fake autographs but I can’t find that verified anywhere and R&M real’s website is not “upscale” if you know what I mean. Do you have any dealings with Charity Fundraising Packages and do you even know of Michael N. Ciravolo as any type of signature expert? I have a medallion which I purchased at a Joe Dimaggio silent auction many years ago. The medallion is a commemorative of the Rumble in the Jungle Muhammed Ali fight. I was told at the time that 200 of then had been made and given out to Ali’s entourage that accompanied him on this fight. Could you tell me what it may be worth. Thankyou.